Shutdown is an interesting command line program found in Windows 7 and earlier operating systems such as XP. 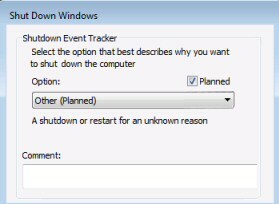 Administrators love testing the shutdown command because it has such a dramatic effect – it can down a network computer. The shutdown executable is available at the command line in Windows 7, Vista, XP and also the Windows Server family. Once you launch the DOS box by typing cmd, your first decision is do you want to shutdown (/s), or reboot (/r) the computer? Sooner or later everyone makes the mistake of accidentally shutting down the local machine instead of the target computer that they really wished to reboot. To recover from this mistake pay close attention to the syntax of the abort command Shutdown /a. Shutdwon -s -m \\ComputerName, in this example, ‘ComputerName’ is the hostname of the remote operating system. None of these commands are case sensitive so sHUTDOWN /R /m \\ComputerName would work just as well. For example, shutdown /s /m \\127.0.0.1 Such a command is useful in batch files. Alternatively, to reboot numerous computers try PowerShell’s command Restart-Computer. Note 3: For once the sequence of switches is vital, hence shutdown /m /s \\Laptop does not work. Consider making a shortcut to shutdown. The advantage is that you can include the /i (-i) for interactive switch. 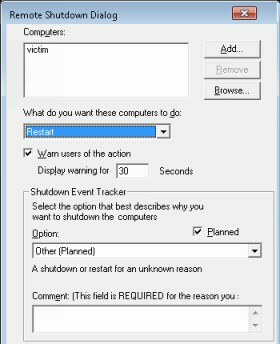 The benefit is that you have a GUI to control your shutdowns or restarts. PowerShell v 2.0’s Restart-Computer is very similar to the Windows 7 shutdown /r command. 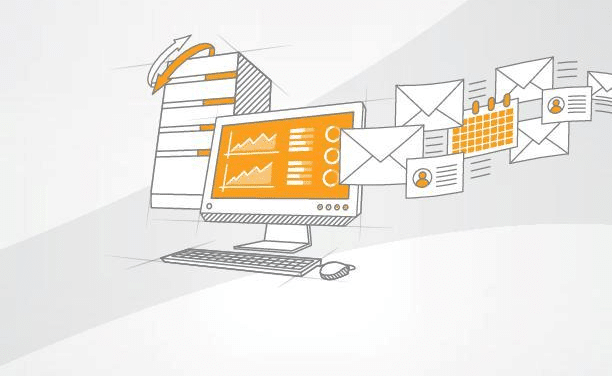 A likely scenario is that you wish to automate the reboot of a or remote server. With a tiny substitution to the cmdlet’s verb you could change the command so that it simply shuts down the computer. See more about using PowerShell’s Restart-Computer cmdlet. 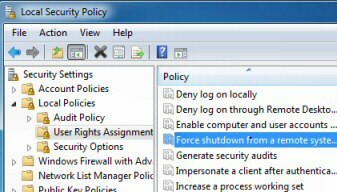 If you are running a training session and the delegate from hell keeps shutting down other students machines by abusing shutdown -s or -r, then configure a policy to prevent ‘Force Shutdown From A Remote Machine’. It’s fun to learn the Windows 7 shutdown command line switches, and one day they will save you a long walk when you want restart or stop a remote computer. My advice is to perfect the /a (abort) switch, that way you won’t panic if you issue a command to shutdown the local computer instead of the network machine. For beginners, shutdown /i gives you time to check the options in a GUI.